Members of IAEP Local 87 were recently recognized for their leadership and achievement within New Jersey’s EMS community. 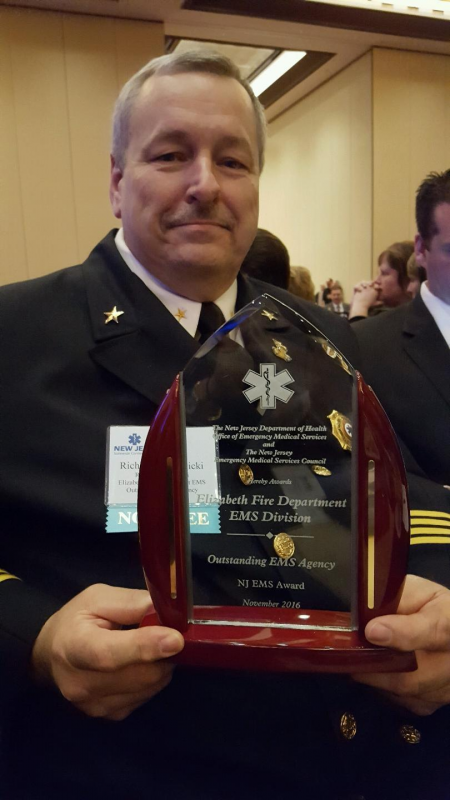 On Friday, November 18, 2016, Elizabeth Fire Department’s EMS Division was named 2016’s “Outstanding EMS Agency” by the New Jersey Office of EMS (NJOEMS) at their annual Statewide Conference in Atlantic City. “This agency has evolved as a true leader in EMS response,” said NJOEMS Education and Certification Manager Candace Gardner, during her announcement of the award winners. Gardner proceeded to highlight the many strengths and recent accomplishments of the EMS professionals, including their role as an agency of the New Jersey EMS Task Force. IAEP members from across New Jersey were also at the award ceremony. When the winner of Outstanding EMS Agency was announced the applause was noteworthy. “It was deafening in the room. Especially the excessive celebration with the help of Local 200 members at the table next to us,” said Wagner. This wasn’t the only award won by Local 87 at the conference. 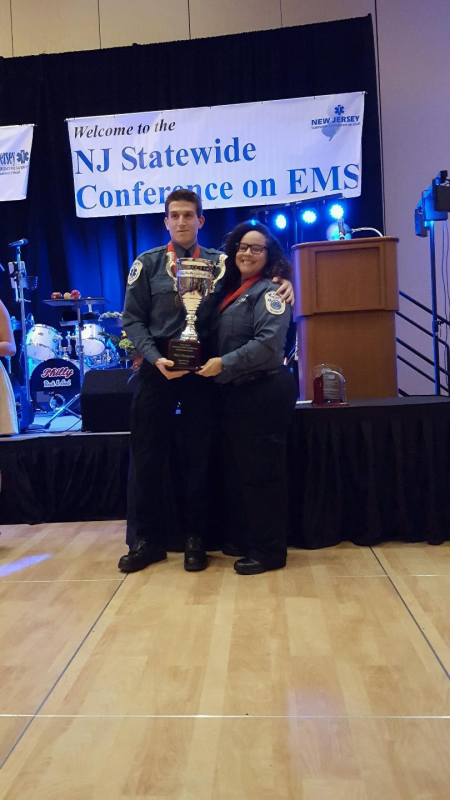 Elizabeth EMTs Russel Cahn and Amber Henderson outperformed EMS professionals from across the state in the SIM Games, a competition between teams of EMTs and paramedics from agencies throughout New Jersey. “The final simulation was an Active Shooter Response similar to the tragedy in Orlando this year. Our team did amazing, they were near perfection in their response,” said Wagner. The New Jersey EMS Conference website states that these awards "recognize EMS providers who have gone beyond what is expected of them in their day-to-day duties." As Gardner said of Elizabeth EMS, “They not only respond to over 19,000 calls a year, but they are a major state asset,” said Gardner. Earlier this year, the EMS crews were on scene with area police, fire, and FBI bomb squad units when pipe bombs were found near a train station in Elizabeth. In late September, the IAEP members were among first responders treating over 100 people injured in a commuter rail train crash. The IAEP recognizes these dedicated EMS professionals for their commitment to continuously improve the quality of emergency response care they provide to the city of Elizabeth and residents of the state of New Jersey. Watch a video of the NJOEMS Award Dinner by clicking here. Elizabeth EMS professionals being honored at the 2016 NJ EMS Awards Dinner. EMTs Amber Henderson and Russel Cahn won 1st place in the 2016 SIM Game Finals. Chief Biedrzycki displays the 2016 Outstanding EMS Agency award. 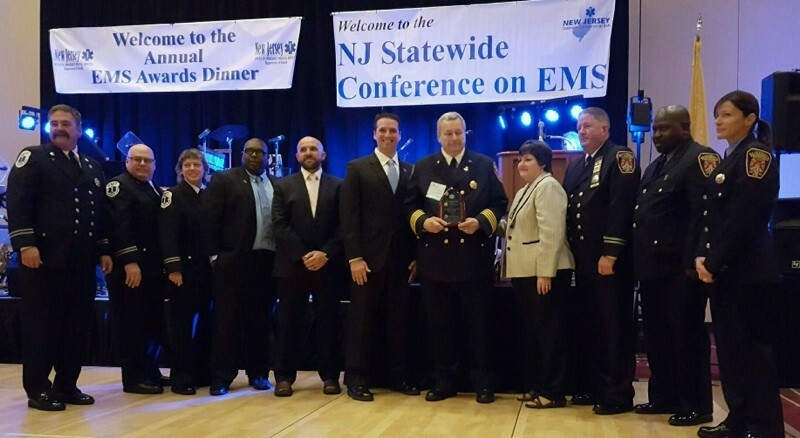 The Award for Outstanding EMS Agency: Honors an EMS agency that has assumed a leadership role in EMS by achievement in areas of patient care, public access to EMS, disaster preparedness, public education and/or training in New Jersey. The service maintains a positive image in the community and has taken meaningful and visible steps to assure quality of patient care, professionalism of its personnel and identifying and taking steps to improve the service in areas such as response times, quality improvement programs and continuing education. IAEP Local 87 members were honored at the 2016 NJ EMS Awards Dinner on Friday, November 18, 2016.